Note: 1.The smartphone is not included. 2.The Macro Lens and the Wide Angle Lens are already attached together when you receive them. 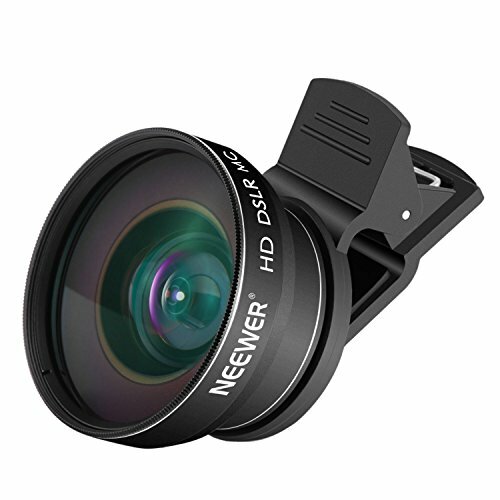 1.2-in-1 Lens Kit includes a 140° Wide Angle Lens + a 10X Macro Lens. The perfect combination is designed for capturing travel scenery, wide landscapes, detailed close-ups, and unique selfies. Crafted with aluminum alloy and multi-element coated glass to minimize ghosting, reflections, lens flare, and other artifacts. Wide Angle Lens opens up your field of view for breathtaking landscape photos or selfies. Macro lens gets you 10X closer to your subject for extreme close-ups, which can significantly expand the field of view and capture more of what is in your peripheral vision without distortion. Detachable soft rubber clip is easy to adjust and won't leave any scratches or marks on your mobile device. Perfect for iPhone 7 plus 6s, 6s Plus, iPhone 6, 6 Plus, iPhone 5, 5s, iPhone 4 and Samsung Galaxy S6, S6 Edge, S5, S4, Galaxy Note, LG G4, LG G3 and many more.